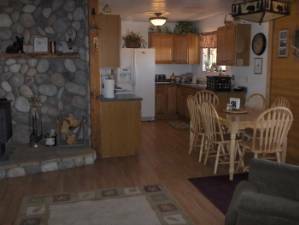 2800 square foot cabin sleeps 16. Three bathrooms, six bedrooms. 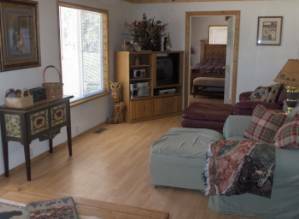 Located in Southern Utah, Duck Creek Village. Fishing, hunting, ATVing, snowmobiling and horseback riding are just a few of the attractions. 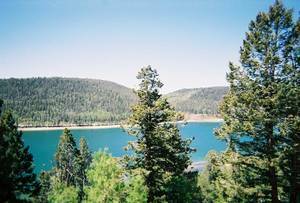 Navajo Lake, Cedar Breaks National Monument, Brian Head Ski and Summer Resort, and Panguitch Lake are all within a 20 minute drive of Duck Creek Village. 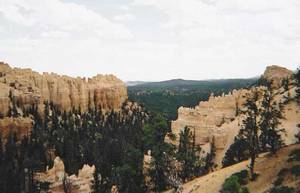 Zion and Bryce Canyon National Parks along with the Grand Staircase Escalante National Monument are each less than 45 minutes away. 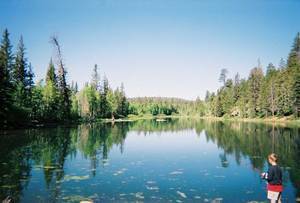 Aspen Mirror Lake, a popular fishing spot, is just a short walk behind the cabin. 16 person maximum unless approved by owner and with extra charges per person. Go to www....com and enter the location you are leaving from and the destination as Cedar City, Utah. Once you get those directions, here is how you get to the cabin from Cedar City. Take Route 14, which is off of Main Street, next to the Zion Bank. Follow Route 14 up the mountain 29 miles to Duck Creek Village. Turn left off Route 14 into Duck Creek Village, follow the road straight, this is Movie Ranch Road. Our cabin is around the bend on the left hand side. 80 Movie Ranch Road. A calling card will be necessary to make long distance phone calls. ATVing (All Terain Vehicles). We have over 500 miles of ATV trails in our area. Aspen Mirror lake is just a short walk out the back door! Flat screen TV with a bar in the room! We have had a super time here at Bear Cabin. Although we only stayed 4 nights while on our fly, drive holiday around West America. We have come from the UK where it is mainly wet at this time of year and the boys absolutely loved the snow. It was truly amazing to travel around the sights here at the various canyons where it is 60 – 70 degrees Fahrenheit and then to come back to the cabin in waist high deep snow and a roaring fire was fantastic!! The sights we visited were the Bryce Canyon, Grand Canyon, Zion Canyon and Pinion Deserted Cowboy Town which the boys loved – right out of an old movie set. 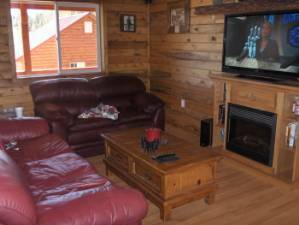 The cabin is fantastic and we would like to thank you for the wonderful time we had here. Thank you for sharing your wonderful cabin with the rest of us! We enjoyed our President’s Day weekend here in Duck Creek. There was awesome snow and we spent Sunday snowmobiling, sledding & snow-shoeing. 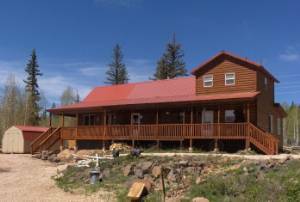 We look forward to our next visit and hope to stay at the Praying Bear Ranch again! Thank you so much for the use of your beautiful cabin. We had such a wonderful time. All of us enjoyed our stay. We will cherish these moments forever! Thanks! As you can tell my brother and friends had a wonderful time here in Duck Creek. Dirt bikes and a home-made go-kart filled up a lot their time. The days were chilly and the nights COLD! Being from Las Vegas, it is always a nice change to see trees and real grass. The towns people are great and Yes! the Smoothies are the best! This cabin is beautiful! The rooms are the best. Just about all of the sleeping spots were used. Glad the cabin was big enough for this crew! We will most definitely come back! Thank you Mark and Lynn for letting us stay at your beautiful cabin! Wonderful place to stay. We have been there twice now and are looking forward to a third stay. We bring the kids and they absolutely love it. The cabin is very cozy. Lots of room for us and the kids. Lynn and Mark have always made sure we were comfortable and that we have a nice stay. I would recommend this cabin to anyone. Wow! I had a nice, relaxing visit. I took walks in the beautiful village each morning. Some evenings the deer would walk up to the cabin and I could watch them through the big windows. 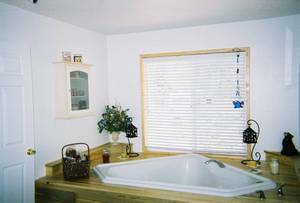 I loved the jacuzzi bath in the master bathroom. Great place to hang-out and have fun. One of the best cabins we have stayed in. We took lots of stuff other cabins did not have only to find them already there. Just take food and drink, everything else is there for you. Cabin was in great shape, great rooms, toasty warm (we went in the winter) So good we went back 4 weeks later. I stayed at the cabin in Duck Creek and it was beautiful. The cabin was very clean and decorated beautifully! The master bathroom was resort like with the large jacuzzi tub. The lake behind the cabin was incredibly close and picturesque. Perfect for my two children who loved the hiking and fishing. Also perfect for a romantic get-a-way for two! Remote setting for those who like camping but with all the amenities for those who don't. Weekends are considered Friday and Saturday nights. Sunday thru Thursday are weekdays. Holidays subject to change at owners discretion. Deposit: 50% deposit required to hold reservation. Remainder due 30 days prior to occupancy. Cancellations and Refunds: If cancelled 30 days before stay $125 processing fee. Within 30 days of stay forfeit deposit.